Molly received her Bachelor of Arts in Spanish and psychology from the University of Dayton and her Master of Science in Communication Disorders from Arizona State University. She is an active member of the American Speech-Language Hearing Association. Molly has worked with Tri-County Therapy since 2016 providing community and clinic based speech therapy services to English and Spanish speaking patients. 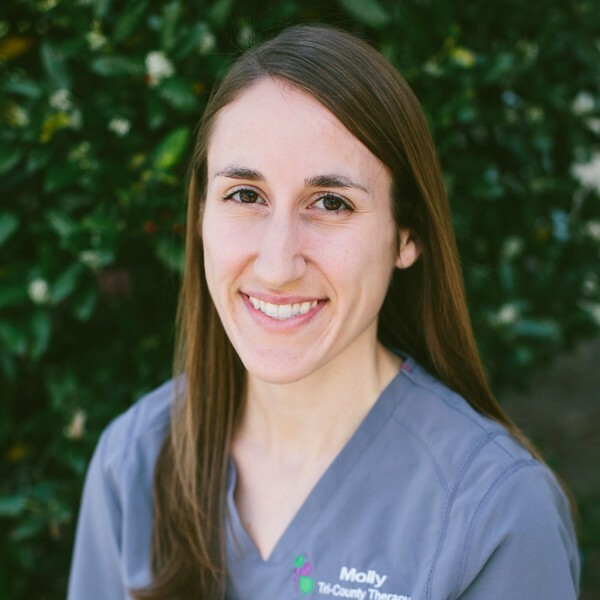 Molly has previously worked in the pediatric hospital and outpatient clinic settings with young children and adolescents with a variety of speech-language disorders. She has particular clinical interests in bilingual language development and serving the needs of bilingual (Spanish-English) children with communication disorders, as well as children with fluency disorder, autism spectrum disorder, and childhood apraxia of speech. Molly completed Krisi Brackett’s CAN EAT course, which provides a medical, motor, behavioral approach to feeding disorders in children. In her free time, Molly enjoys spending time with her husband, running, hiking, and reading. Molly and her husband are welcoming a sweet baby girl in November, 2017.